DeVos said she would address “the needs of all parents and students” but that a one-size-fits-all model doesn’t work in education. But Democrats on the Senate Health, Education, Labor and Pensions Committee grilled the wealthy Republican donor on a range of issues Tuesday from sexual assault to child care, students with disabilities and making public colleges and universities tuition-free. Sen. Patty Murray of Washington state, the top Democrat on the committee, said she was “extremely disappointed” that DeVos had not finalized her financial and ethics disclosures ahead of the hearing. She also asked whether DeVos would divest herself of any family business enterprises that may represent a conflict of interest in her job, including one student loan refinancing company. “Where conflicts are identified, they will be resolved. I will not be conflicted. Period,” DeVos said. Amid concerns that DeVos’ conservative religious views might make her a poor advocate for the rights of the LGBT community and other minorities, DeVos stressed that no students should face discrimination. Alexander read into the record a letter of support from the Log Cabin Republicans, a Republican organization pushing for LGBT rights. 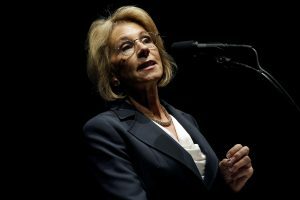 LGBT groups also have protested Trump’s choice of DeVos, saying she has funded conservative religious groups that promote what they consider to be traditional family values, including one organization that supports conversion therapy — counseling of gay, lesbian, bisexual or transgender people with the aim of changing their sexual orientation.